I read a variety of books from fiction, psychology, business, self-help, romance, young adult, and even some investment and “how to” type books. 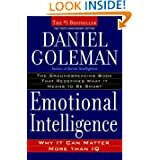 I just finished reading “Emotional Intelligence” by Daniel Goleman. Emotional Intelligence is not a new book. It was orginally published in 1995, but the information is still as accurate and vital as it was then. This book is an eye opening book about the effect our emotions have on our lives, relationships, and the choices we make. Daniel Goleman is not alone in thinking that emotional intelligence is more important than IQ. The book is a good read both for the psychologist or therapist wanting to increase their knowledge about the subject, and the average person wanting to learn more about how emotions affect how we relate to each other and our abilities to respond and handle the events in our lives. 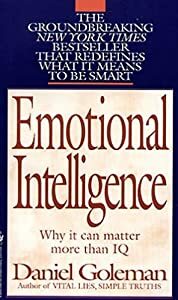 I enjoyed reading Emotional Intelligence because it helped me learn better ways to relate to my teenager, to understand how my responses, reactions and expressions I used as I talked or listened to her would directly impact how she would respond and react to me. I’ve put much of the information I took from this book to good use in relating to friends and family. If you like good non-fiction books then you might enjoy Emotional Intelligence. « Journaling A Past Time, A Legacy, A way to stay Sane!